Oh, sure, some people think that the most interesting thing about you - maybe the only interesting thing about you - is that you write books. But you know better. You have so many interests. You have such a wide-ranging mind. You have so much to share with the world. By the way, while you're having fun expressing yourself on your site, you're also adding content that will attract visitors to your site. Thanks to all the good links you have on every page, some of those visitors will look around. Some of them will end up looking at the pages you've created for your books. Some of them will end up buying one of your books. Am I advising you to leaven your self-expression with a certain amount of cynicism? Well . . . yes. You want content on your site that will show up in search engines or which other people will want to link to on their sites. That will bring you more visitors - "drive traffic to your site," as they say in the biz - and that can mean book sales. Even if increased traffic doesn't result in measurable sales of your books, I can assure that it's extraordinarily satisfying to know that large numbers of people are reading the material you're publishing on the Web. So, beyond the pages devoted to your books, what sorts of things should you have on your Web site? Photographs of you, of your family, of your pets, of your house, of your friends, of your vacations, of the study where you write your books . . . The rest of your site shows the world your inner self. The photographs section shows everyone your outer self. It's remarkable how interested people are in that outer self. They want to know what you - and your spouse and kids and pets and so on - look like. It's in the nature of things that most of us are rather ordinary looking. That's fine. No doubt, if you're physically attractive, that won't hurt your book sales, and your photograph alone will very likely drive traffic to your Web site. But people aren't looking only for photographs of beautiful people. In the case we're interested in, they're looking for photographs of the author. 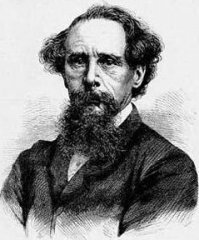 Consider, for example, Charles Dickens. I bet you just spent a few extra seconds looking at that old photograph, despite the weird beard. Because it's a photograph of one of the greatest novelists in the history of the universe. And also because it shows him to be an interesting, not to mention tortured, man. You don't have to look tortured in your photos, though. You should look like yourself, and you should look at the camera with as open and pleasant and friendly an expression as possible. Don't make the mistake of using professional portraits that try to make you look glamorous and artificial (unless glamorous artificiality is the real you). And for God's sake, don't use any pretentious artist pictures. You must know the kind I mean: high-contrast, brooding, intense expression. Tortured soul. Some of them even show the author with his chin resting on the back of his hand. Have some consideration for other people's eyes! Don't forget captions. Tell who or what it's a photo of, and where and when it was taken. Viewers want to know that. Moreover, in addition to the other reasons for having photographs on your site, they're part of the historical record. Although it's desirable to have a lot of photographs on your site, showing a variety of people, places, and things, there are practical limits. Photographs are large files, even if you reduce their size to the limits of visibility. This has an effect on the total amount of disk storage you're using at your ISP. ISP's almost all set some upper limit on total disk space (although that limit has been creeping up as huge hard drives keep getting cheaper); if you go over that limit, you might find yourself being charged an extra fee every month. ISPs also limit the amount of data you can move over their connection to the Internet - that is, the total number of bytes sent by the server to people looking at your Web pages. If you have a lot of photographs in a Web page, that means a lot of bytes squirted out over the Internet to anyone who looks at that page. Too much of that, and you could get another additional monthly charge for exceeding your bandwidth allowance. Common sense has to rule in all of this. If you're a woman or old person living alone, you might not feel comfortable having any photographs on your site, or at least not any that show you or your house or apartment building. You should have a links page on your site - a page containing links to other Web sites you want people to be aware of. (For an example, see my links page.) The links you put on there can be personal, political, artistic, generally informational . . . Anything you want, really. It's part of how the Wonderful World Wide Web works. Without links, it's not a web but just a scattered collection of HTML pages. So be Webbish and link. If there's a site you really like, you want other people to know about it, and you might as well make it easy for them to get to it. Some of the sites you direct people to might add links back to your site (especially if you contact them and ask them to). So you both benefit by driving traffic to each other's sites. People searching in Google for something mentioned in one of your links will see your links page in their Google search results. Some of those people will have a look at your links page as a result. Because your links page has prominent and interesting-looking links to other pages on your site, some of those visitors will then have a look around your site. Some of them might even buy some of your books. Essays on various subjects - political, sociological, humorous, rambling. I've been slowly adding to the essays on my site (see the Essays link at the top or bottom of this page), and I'm amazed at how many hits some of those essays get. Nor is it the essays I expected would be of most interest. So if an idea occurs to you, and you feel like writing a few paragraphs on the subject, then write those paragraphs and put them on your site, no matter what the subject may be. Pages about your hobby or hobbies. If it interests you, it's bound to interest other people. They'll want to read about it. Google will lead them to your site. Anything else that occurs to you. If it can be presented over the Web via HTML, then put it on your site. You want those visitors. In the section titled Your Own URL, I preached against having a Web site devoted to a single book or even a series. What we've been discussing in this section constitutes another reason for not doing that. If your Web site is a general one, devoted to everything about you rather than everything about just one of your books, then you'll have lots of different content areas of the sort listed above. Google will lead people to those content areas and therefore to the rest of your site and therefore to your books. But if your site deals only with one book, then you'll have no valid reason to have those other content areas on the site, and therefore you'll miss out on all that potential Google traffic. You want to draw as wide a range and great a number of people to your site as possible. And then, of course, you want to keep them there, trapped by the intriguing links and interesting pages, wandering around your site for hours.